The sunflowers we planted back in May have bloomed, finally. Two varieties sown in the same pot with very different outcomes. Nature definitely trumps nurture for these babies! One of our customers gave Bill good advice about pruning the vines we planted beneath the pergola which are doing fine in terms of growth, but with no sign of fruit this year. We’ve had a busy three days with the end of season steam gala and the fine weather bringing in lots of people. There’s some unknown force (is it dark matter) that means the longer the queue, the more complicated the order people at the front will ask for (can we have all three double shots, one of them decaff and tea with the tea bag out please? And do you have soya?) - we smile and we make it all as quickly as we can. 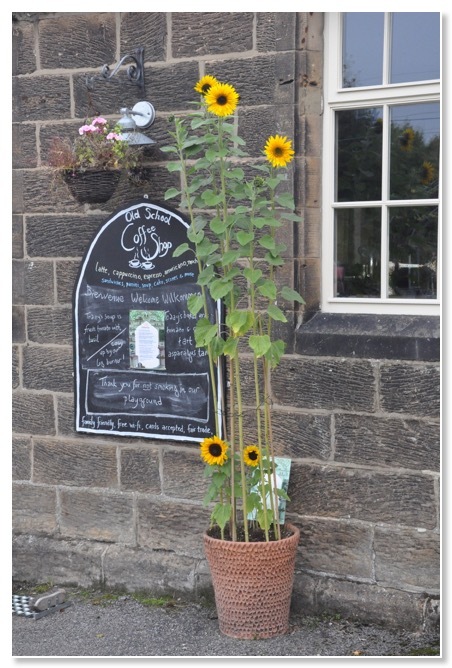 Fortunately, the crowds were patient and good natured and we had lots of nice comments about the place. We were also lucky to have our elder son Jack and his wife Amy with us on Friday, as we couldn’t have managed without them. Amy even found time to make chutney from the masses of apples in the garden of Applegarth, our holiday cottage. 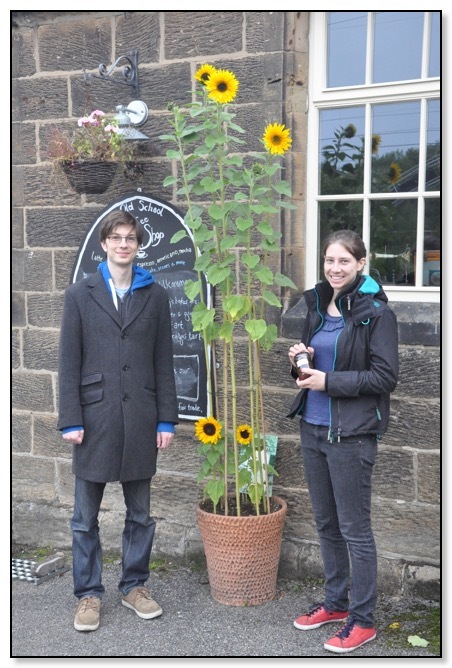 We grabbed a picture of our ‘zero hours contract’ staff by the sunflowers just before they headed back to London. 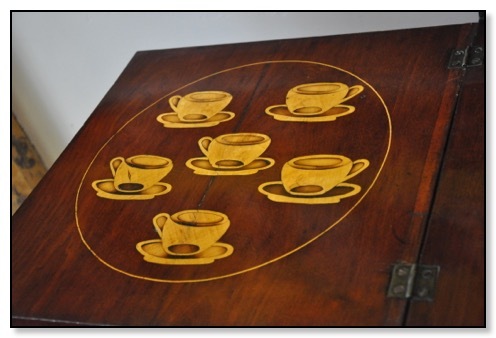 On our last day off we found these marquetry coffee cups in an 18th century (well that’s what it said in the guidebook) sideboard. We’ll need to look out for one in the auction. 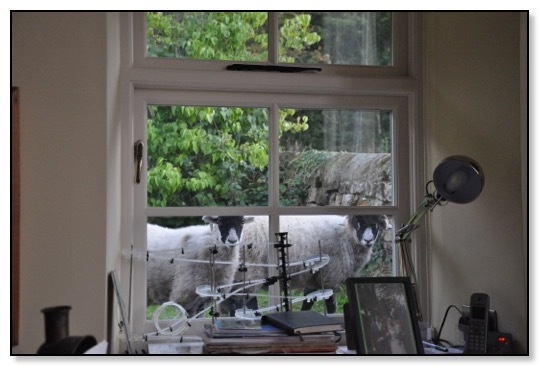 We have got used to people walking past stopping to look in the window of the part of the school we live in. The footpath goes right past and it’s very tempting to take a peek. One day last week some customers, who had obviously done this before coming into the coffee shop asked us “Is the lounge open today?” The following evening we had some even more curious visitors. Little Bo Peep must’ve had a day off. 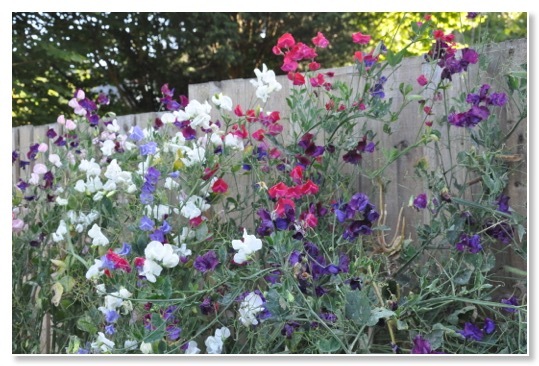 Our sweet peas are blooming for the second time this summer thanks to some timely ‘deadheading’ of the first crop by one of our friends. It feels like a bonus, as does the warm sunny spell we’ve been enjoying this week since the schools went back after the long holiday. The summer has been busy and, overall, our turnover is up on last year, which is reassuring. Lots of repeat visits too. We had our first day off on Monday since the beginning of the holidays, which felt like a real treat. It’s odd to think that the school is now busiest at what used to be its quietest time. One of the things we achieved on our day off was the construction of two shelf tables on the front wall of the playground. 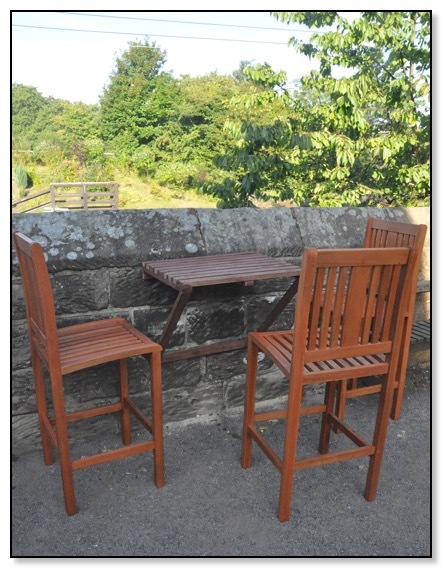 These, when used in conjunction with the outdoor bar stools we’ve managed to find, mean that people can look over the wall to see the trains arriving and departing without having to stand up. This has the added advantage for us of advertising our presence to people arriving on the trains. The new seating has already proved very popular. We’ve got a couple of months more to do, including the very busy ‘War Weekend’ in October, before we take our long break from the beginning of November. We’ll have Mondays off in September and may take Tuesdays too if it gets quiet in October. We’re closing at 4pm now too instead of 4.30pm which means we’ve got a bit more of an evening after clearing up. The continuous stream of nieces, nephews, their friends and our own children coming up to stay and to work for anything from a few days to a fortnight really helped us through our busiest time of the year. We enjoyed seeing them acquiring or honing their barista and baking skills. You can find a gallery of Old School Coffee Shop alumni here. Bill was beginning to feel persecuted when he kept finding bird poo at the entrance gate in the mornings. It seemed like a precision strike from a seagull with a vendetta against expertly made cappuccino and home baked cakes. It was only when he looked up and saw the gateway arch overhead he realised the culprit was more likely to be an owl resting at our entrance after finding us closed at 2am in the morning. We are going to try and sneak a peek out there the next time we hear screeching and hooting in the dead of night.